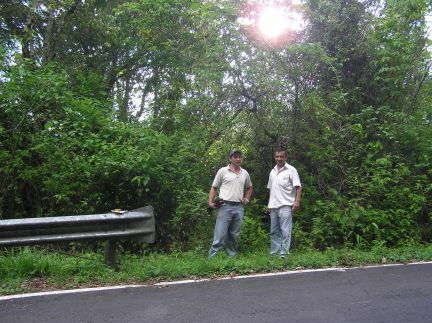 The mountains of Chiriqui are dotted with tens of thousands of mountain-fresh springs. Most of these natural water sources can be counted on to provide gallons of pure fresh drinking water – but 12 kilometers north of Volcan, there is one spring that is totally unique. This is Panama’s answer to France’s famous Perrier water. 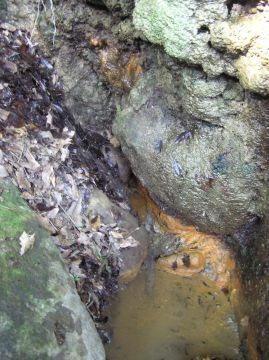 But Panama has gone one better, the water from this spring not only bubbles like its French counterpart, but it has a natural sweet taste – but wait there’s more. If you take some of this organic bubbly and keep it for a few days it will pleasantly surprise you, by turning a pale shade of blue. 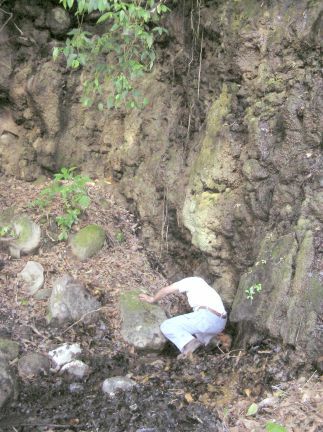 Local Chiriquean, Esteban Gonzales, first discovered the spring in 1942. Esteban’s son has been given the water as an elixir for upset stomachs ever since. He is still alive ,well and as I discovered recently, remarkably fit. On a warm sunny April afternoon, I ventured out to see this wonder along with local historian Ivan Flores. After many twist and turns on the Rio Sereno road, Esteban told me to pull over. He led Ivan and myself though a gap in the roadside hedge and then down an almost vertical cliff. Ivan, has a medical condition that prohibited him from venturing further. When faced with the near vertical 80 foot drop, I has second thoughts. I was carrying my new Sony Hi-definition camera and if I dropped it, I would have a medical condition courtesy of my wife. The thought of her inflicting several sub-dural haematomas caused me to pause. I left the video camera with the Ivan, and using both hands clambered gingerly down the slope. After a few yards we ended up close to the surging Colorado River. 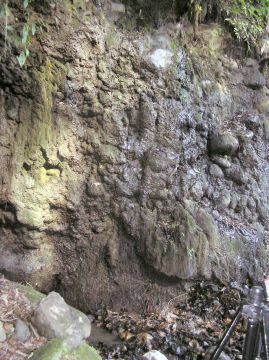 Esteban pointed to the moss covered vertical cliff face and indicated that this was the famous spring. There were minute drops of water dripping down and I cupped a few in my hands. It tasted fresh and cool but Esteban told me this wasn’t the real Mc Coy. At the base of the cliff he scraped away a pile of rotting leaves and uncovered the mouth of a spring. The air was filled with the pungent smell of either sulphur or rotting leaves- I couldn’t quite tell which. Then Esteban dug into the sandy soil and took a mouthful of the water. he motioned me to do the same. being British, and not wishing to appear the wimp, I placed my hand into the murky hollow and took a short drink. Wow! I thought, this is sweet. I turned to Esteban and in my best Spanglish said. “Dulce.” (sweet). He was obviously delighted and posed for several pictures in front of this aquatic edifice. The afternoon sun was sending shafts of bright sunlight through the canopy and partially illuminated the rock face. Silly me, I hadn’t brought a bottle or container to take a sample of this wonder water back home. That would have to wait for another day. I clambered back up the steep rock face and met up with the waiting Ivan. Back at the road I decided to make this auspicious occasion an historical one. With Ivan and Esteban’s approval we formerly named the Spring the “Esteban Gonzales Fountain.” in honor of Esteban’s dead father; the original discoverer of the spring. Back at the expedition headquarters – the Café Essenzia in Volcan, I asked Esteban if he had found any special qualities to the water. The only thing he knew is that as children, his mother had given it to them as a medicine for upset stomachs. Could this wonder-water be a natural panacea for today’s medical malfunctions such as hemorrhoids or erectile dysfunction? Only time and the drinking of copious quantities will reveal. The sweet, blue-water, fountain is not on any guide map and very few locals know of its existence. If you are a visitor to the Volcan area and want to hike into the mountains and see this unique geological wonder – then drop by the Café Essenzia, and ask Ivan Flores to guide you.